Tuesday is a public holiday as it is Canada Day, where we celebrate the birth of our nation. It’s kinda awkward to return from the weekend, work one day, and then take one day off again. Some people have no choice, it’s just what they have to do. Others have chosen to just take a vacation day on Monday and make it a four-day weekend. My place of employment gave us the choice of either taking Monday or Tuesday off. I decided to take Monday off, so I can keep this weekend going. I didn’t work last Monday either, which makes this two long weekends in a row. That’s awesome. The slightly sucky part is that on Tuesday, I’ll be heading to work when everyone else is celebrating Canada Day. Well, fair trade I guess. Less than two years ago, I managed to snag a free computer from a local gaming company that was giving away older machines. I documented the event here. From that computer, I salvaged a CPU, a hard drive, and more RAM, all of which were considerable upgrades to my own home computer. That allowed my computer to get some fresh legs. This afternoon, my current place of employment just happened to give away some free computer components. There were about five motherboards with i7-920 CPUs and 12 Gb of RAM. I managed to get one of these. All these components are again a considerable upgrade from what I currently have in my home computer. Installing these pieces into my home computer is going take a lot more effort than the last upgrade where my friend helped stick on the CPU and I just plugged in the new hard drive. A new mobo installation means I have to disconnect everything my old mobo, take it out, put the new mobo in, reconnect everything, and then also prepare Windows to accept all the new hardware. The result should be a computer that is almost twice as fast as my current one but the risks are a bit higher. The price is good, however, so I can’t complain about that! So I was ravenous for lunch today. I didn’t have much of a breakfast so by the time noon rolled around, I was super hungry. I went down the street to SaladWorks that had just opened up, the first one apparently in Canada. I thought I’d be healthy and get the maple glazed salmon salad. It turned out to be ok but I was so hungry that this lunch-sized salad was pretty much just an appetizer to me. I knew I’d be hungry again well before the end of the work day. Just like clockwork, I was hungry again around 3:30pm. I originally had my sight set on a cheeseburger of some sort but I settled on a bahn mi from DD Mau. I made a split second decision while ordering to get a full-sized sandwich instead of a half just because I sure as hell wasn’t going to feel hungry again before leaving work. The sub was delicious and I was definitely was sated. I hope I don’t have to eat two lunches again tomorrow. So I’m going to Alaska at the end of July! I have two friends who are traveling to Anchorage to take a motorcycle trip up through the state, all the way up to the Beaufort Sea. They’ll be spending a few days in Anchorage before embarking on the road and that’s when I’ll join them. We’re still working out the details but I think we want to see some glaciers and wildlife. I’ve only been to Alaska once and that was to Ketchikan via cruise ship. I was there for just a few hours as I had to get back on the boat before it sailed without me. This time should be more of the real deal. Anchorage is farther north than Ketchikan and I’m looking forward to the very long summer days. I’m excited! I took the day off today as part of my continuing to take a random day off during the summer. There’s no public long weekend holiday in the month of June, so I decided to make one for myself. I slept in until 11am which left me with a rested feeling upon waking up. I then spent the afternoon cleaning up my apartment and playing video games. For dinner, I had spaghetti and some BBQ ribs. It wasn’t a jam-packed day but a leisurely one and that’s the kind of day I wanted. I wish I had employed this “day off” strategy when I was working at EA. I accumulated so much holiday when I was at Black Box. I was paid out for those days when I got laid off but I probably should have just taken a random day off here and there. I’m looking forward to another extra long weekend in July. This post will be of interest to anyone who owns a website domain and/or publishes a blog. In a previous post, I mentioned how my e-mail host, GoDaddy increased my annual hosting fee by several hundred percent. They also told me they weren’t going to support my current e-mail platform going forward. Wow, charging me more and telling me I won’t get any new features nor support? Sounds like a great deal! I have now fully transferred over my e-mail hosting to another company, which doesn’t charge me a cent. Over the last week, I moved well over five thousand e-mail messages from the old GoDaddy server to the new one. Just ten minutes ago, I changed over the MX records. 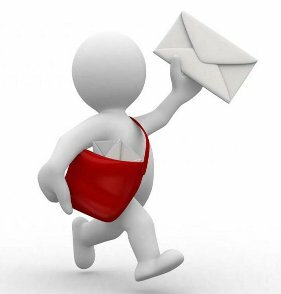 MX records tell e-mail servers where to send messages for a particular address. Think about that card you fill out at the post office when you move. It let’s the post office know that all mail going to your old address should be forwarded to your new address. On the Internet, these changes can take as much as 48 hours to propagate through the system. It’s possible some messages will still wind up at the old server but that’s ok. If all goes well, in two days I’ll be able to cancel my e-mail hosting at GoDaddy and get a refund. Coincidentally, over the weekend, I also had to help a friend with his own GoDaddy issue. My friend, who I will refer to as DeShawn, hosted a blog on GoDaddy using their horrendous Quick Blogcast platform. His blog means a lot to him and it has been a great way for him to express his thoughts. The blog also contained a lot of photos which he hosted on their platform. GoDaddy is retiring the Quick Blogcast platform this week but he only got the notice late last week. While DeShawn is an extremely smart man with PhD and MD degrees, blogging platforms and hosting details are not things he is an expert in. He called me to help him rescue his blog and all his content. He needed my help because GoDaddy was completely useless in assisting him transfer his content to another blogging platform. What little advice he was given was basically wrong. It took some trial and error but I was able to move DeShawn’s entire blog, including all his posts and his content from GoDaddy’s servers to a new WordPress blog. DeShawn’s situation taught me a valuable lesson about Internet content. Be very wary of using proprietary systems to generate content for your blog or website. The company that owns that proprietary system can leave you at their mercy based on a whim, just like what happened to DeShawn. Always have an out. If you can’t export your blog, posts, images, videos, messages, e-mails or whatever in a reasonable amount of time, then you might have a problem. You have to be prepared that you’ll need to move all that content in just a few days. As a final note, if anyone was thinking about e-mailing me, there’s a slight chance things might go a bit wonky so if you don’t hear from me, send me the message again. Well, Conan went to another E3 this year and he taped his visit. For a guy who doesn’t particularly like video games, he sure does do a lot of video game segments. I was only slightly envious at one part, where he got to experience a Project Morpheus demo. So as I mentioned in my previous post, I’m moving to a new e-mail host. Since about 2006, my personal domain e-mail has been hosted at GoDaddy. For this privilege, I started paying about $4 a year. This has gone up steadily where eight years later, I paid $8 last year to renew my e-mail hosting plan. The plan is up for renewal at the end of this week, so on the weekend, I decided to renew. After logging into my hosting account, I discovered the renewal few had gone up to $48. As far as I could see, no new functionality had been added. I was just going to pay a lot more for the same level of hosting. It took two phone calls but I finally discovered GoDaddy is trying to move all their e-mail hosting clients to their new Office 365 platform. I don’t need fancy things like Office application integration across the cloud. They’ve jacked up the prices of their existing e-mail platform, hoping everyone will just move over to the new one since the prices are now so similar. Well, I wasn’t having any of that. I decided to move to a new e-mail host. They are many different companies to choose from. Some companies are competitors to GoDaddy who also do domain registration and web/e-mail hosting. Others just host e-mail. The price also varies from company to company. I quickly chose a company that offers a free account with a lot of options. I get 5 Gb of storage for my e-mail, compared to the 1 Gb on GoDaddy. There’s also acronyms like IMAP access but let’s not talk about that. Moving e-mail hosts is actually pretty easy if you don’t care about your old e-mails. This is where the difficult part comes. I had to move over 3300 e-mail messages from my existing account to this new server. It was part manual labour and part automation. It went smoothly but I was nervous. I need to repeat the process for my “Sent” items and then again for any other folders I might have. The last part then involves redirecting all my new incoming e-mails to my new host. It’s quite an interesting process. If any of you own your domains, you might have to go through this yourself one day. Ugh, I’ve spent the last several hours trying to figure out how to migrate my existing email account to a new host. It’s taken way too much of my time. I will explain tomorrow why this was necessary. This is one the time I wish I was using a Gmail account. In a previous post, I mentioned how I was saving space by getting rid of all my old DVD cases and putting the discs into paper sleeves. This weekend, I finished the task of transferring the discs to the sleeves. It took about 110 of them. The picture above shows how much space I saved. I think the space savings would be illustrated better if I had been able to stack all the cases in a single pile but that wasn’t going to happen without a lot of effort. Anyways, with the cases off the bookshelf, I was able to find new places to put my laptops and I could finally put all my Blu-ray cases on the shelf, instead of on my coffee table. 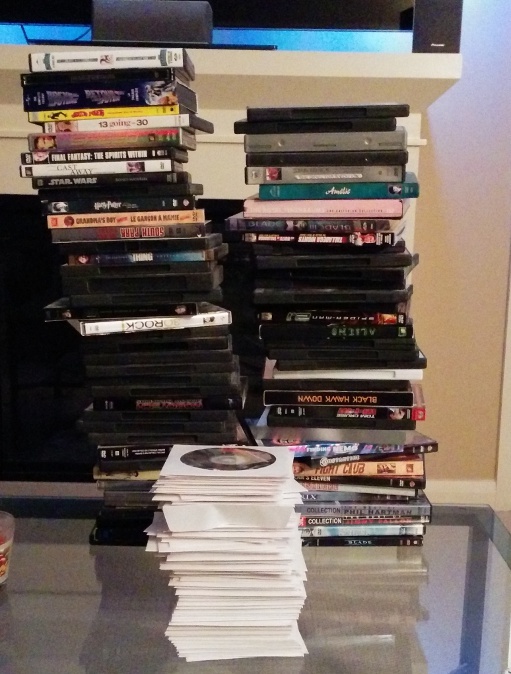 As for the DVD cases, I still need to remove all the paper inserts so I can recycle them in their proper bins.